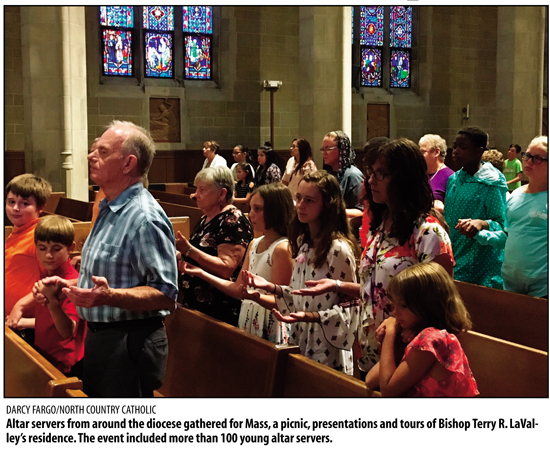 OGDENSBURG – The more than 100 altar servers who gathered for the diocesan Altar Server Mass and Picnic didn’t let a few clouds and raindrops bother them. 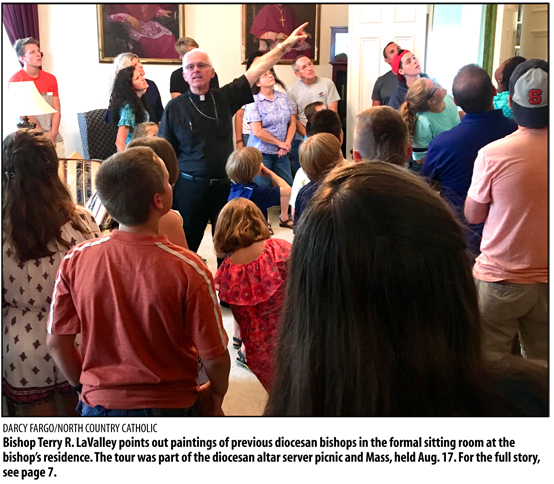 The event, held August 17, included a tour of St. Mary’s Cathedral, presentations by Sister M. Gregory Munger, a Sister of St. Joseph, and Carter Pierce, seminarian for the diocese, Mass celebrated by Bishop Terry R. LaValley, a picnic and a tour of the Bishop’s residence. Sponsored by the diocesan Vocations Office, the event focused on being open to God’s calling. In his homily at the Mass, Bishop LaValley also reminded the altar servers and their families that God has a plan for them. A handful of the assembled servers had the opportunity to serve the Mass. All had an opportunity to join in a picnic, moved to the Knights of Columbus due to rain, and a tour of the Bishop’s residence. Bishop LaValley led the tours, which concluded the picnic event.